Montreal, a city of many enticements, had conspicuously lacked a major art gallery of international calibre until the summer of 1987 when Landau Fine Art opened to critical acclaim in the gracious row of grey-stones known as Passage du Musée. The creation of Robert Landau, a dynamic Montreal businessman, has focused primarily on the great masters of the early to mid twentieth century such as Picasso, Matisse, Dubuffet, Léger, Giacometti, Jawlensky, Moore, Kandinsky, Modigliani and Van Dongen. In the intervening two decades, the gallery has expanded to well over 20,000 square feet of elegant space, featuring hand-crafted boiserie and superb antique carpets that compliment the exceptional works of art in buildings that neighbour the Montreal Museum of Fine Arts on Sherbrooke Street West. The gallery’s trademark “Only Masterworks” is its creed and a testament to the extensive travelling, hard labour and care of Robert and Alice Landau in order to acquire the unique and extraordinary works that hang on these gallery walls. The success of their endeavours is reflected in how frequently the gallery is requested by leading international Museums to loan works for major exhibitions and important retrospectives. 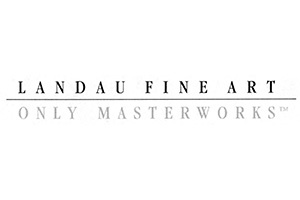 At any given moment, the Landau collection includes many historical and influential works of art by the leading artists of the twentieth century. Prime examples of Cubist, Post-Impressionist, Fauvist, Futurist and Expressionist art abound. Currently the collection features a monumental work by Pablo Picasso, a large-scale art-brut oil of Henri Michaux by Jean Dubuffet and an exquisite constellation period painting by Joan Miró.